Mitch McLain looks to the corner on 3/2/18 against Ferris State. 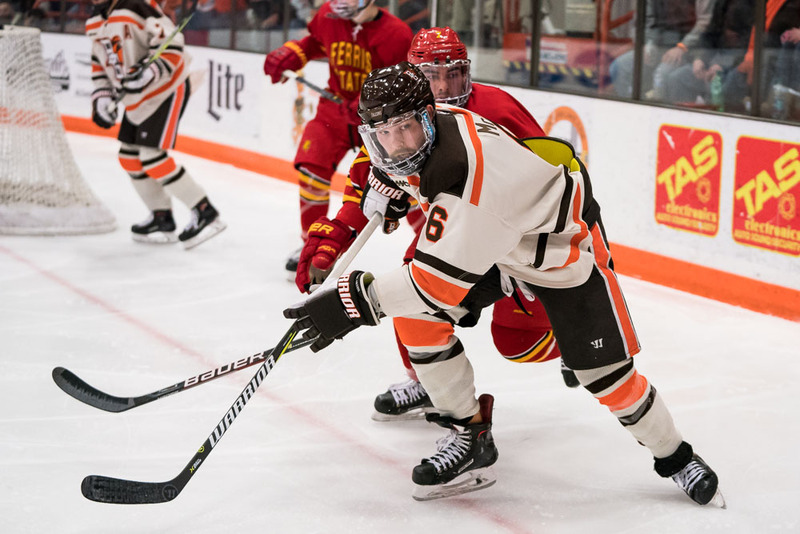 McLain picked up his 100th collegiate assist on Sunday against Northern Michigan (Photo by Todd Pavlack/BGSUHockey.com). Marquette, MI – The 17th-ranked Falcons fought back from two deficits, including a goal with mere seconds left in the third period. But, an overtime goal by Northern Michigan Sunday ended the Falcons’ season with a 3-2 loss in the final game of the WCHA Playoffs semifinals. Ryan Bednard started in net for the Falcons, stopping 39 of 42 shots faced. Atte Tolvanen had 30 saves on 32 chances for Northern Michigan. The Wildcats struck first at 18:55 of the first period. Zach Diamantoni re-directed a pass from Robbie Payne they beat Bednard over his shoulder. Northern Michigan had 14 shots in the opening period while Bowling Green had six chances. The Falcons responded just 52 seconds into the second period on the power play. Stephen Baylis shot towards the net. The puck bounced off Mitch McLain’s skates and came to Max Johnson, who buried his 13th goal of the season. Northern Michigan had nine shots in the middle frame while Bowling Green had eight chances. The Wildcats re-took the lead at 10:00 when Joseph Nardi re-directed a blue line shot, beating Bednard. The cardiac kids of Bowling Green made a playoff appearance with just eight seconds remaining in the third period. With Bednard pulled for an extra attacker, Alec Rauhauser shot on net. The puck deflected off Mitch McLain and trickled past Tolvanen for the equalizer. The goal was also assisted by Stephen Baylis. Bowling Green had 13 shots while Northern Michigan had 11 chances. The Wildcats broke through and scored the game-winning goal at 15:53 of the overtime period when Troy Loggins crossed up Bednard with a shot from deep in the zone. The Falcons had six shots in the overtime period while the Wildcats had seven chances. With the loss, the Falcons’ season ends with a 23-12-6, 17-6-5-2 mark. The Wildcats improve to 25-13-2, 19-7-2-2 and advance to the WCHA Playoffs championship game. 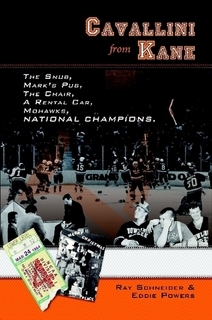 Previous PostPlay the BGSUHockey.com Bracket Challenge, win a BG Memories t-shirt!